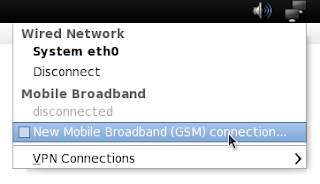 Anyway, the other day I had to set up one of these 3G mobile internet USB modems on a Fedora 12 box. The dongle in question was from Vodafone, purchased about a week and a half ago. It didn't work out of the box, though in hindsight it should have. So for anyone who's googling around on how to set this up (or whether it can be set up at all), here's the gist. Click on new connection, then jump through the wizard and you're done. 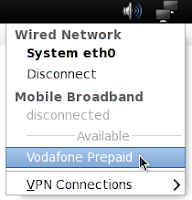 The sad thing is, that if usb_modeswitch 1.1.0 was installed already, it would have truly been plug and play, even though Vodafone claims that Linux is not supported. Oh well, at least this way I've got something to write about to shoo away those tumbleweeds on my blog. Many thanks to Laurianne for letting my try the dongle on the Mac first (and letting me install the ridiculous piece of software Vodafone ships with the dongle) and Tom for running Debian which already was on usb_modeswitch 1.1.0 - showing that the modem works.